I think we can all agree that a smart key organizer isn’t the invention that is going to save the world eventually. Nor is it a particularly socially relevant invention. However, it is a highly practical one and I absolutely love it. Somehow, it was not able to cure my grandmother’s depression, but it sure did save a lot of my pockets from getting completely obliterated. I’m pretty sure that most of you have at least five or six keys dangling from your keychain . Even though that is a pretty manageable number, it can cause some issues especially when you are in a hurry. Atop of that, unconfined keys cause havoc in your pockets. All those wears and tears are not the biggest issues of life but they definitely are unnerving mostly because of their easily solvable nature. You might ask, who is this smart key holder for? That’s a fair question with a very straightforward answer. There’s a lot of guys out there you could consider being outliers. Primarily in regards to tidiness. They love having everything around them neat and organized and this item was made to help them thrive in their quirkiness. Sure, some will not find a key holder as being a very relevant or necessary accessory. Torn pockets will not matter much to them. Maybe they will get a novelty keychain and that is the furthest their key organizing scope will ever reach. And that is fine. Do I care at all about being organized? If the answer is no, my advice would be to skip on the key smart holder. Do not buy it just because it looks cool. Buy it to use it. How many keys do I carry? If you carry a bulk of keys on a daily basis, I think that getting a key holder could only be beneficial to you. The smart key organizer promises to bring style, elegance, and a ton of practicality to your everyday carry. If you were to ask me, I would say that it succeeds in doing so. It is built to last and be extremely user-friendly. Of course, there are more options to choose from than a single universal key holder . Not all keys are the same length, and not all people carry the same amount of keys. That is why having options is of paramount importance. Having said that, apart from the classic version which can carry up to eight keys, you get an expansion pack which holds a couple of extenders and spacers for you to be able to fit six more keys to your holder. Also, if your keys are rather lengthy, you can opt for the extended version of the smart key organizer. I honestly do believe that this piece of accessory is perfect for those who carry heaps of keys on daily basis. You lose the dangling, pocket wear, and tear, as well as the bulk that a massive keychain creates. Let us see what is there to know about the smart key holder. Well, it is machined from aircraft aluminum which makes it incredibly tough, durable and light. Honestly, I cannot stress how compact and comfortable this accessory is to carry around in your pockets. It comes in various colors just in case you want to bring more charm to your EDC setup or even complement your men’s leather gloves. When you purchase it, apart from the assembled holder, you also get a pouch with eight spacers and two extension adapters. These come in very handy when you are trying to fit all of your keys into the holder and stack them evenly. The boring part of the smart key holder is the assembly. I am not saying that it will take the best part of an hour to do it, but you surely will not get it done in a couple of minutes as the ad claims. KeySmart takes pride in the fact that you will not need any tools to assemble their smart key holder. That is a fact. A simple coin will suffice when it comes to unscrewing the main two screws which hold the thing together. From then on, the process is subjected to individual needs. What is necessary to pay attention to is the use of rubber spacers. These are crucial for maintaining the same height on both ends. If you plan to stack more than four keys, you are free to make the best of the provided two extenders. However, do not forget to attach the key ring during the process, because it really is a great feature for attaching your car keys to. As a user of the smart key holder , I would say that it performs its duty fairly diligently but not without a couple of drawbacks. The keys are not difficult to deploy and you can even do that single-handedly. But when you are doing the assembly, make sure not to overdo the screwing part. That will undoubtedly affect the ease-of-deployment. I personally like the fact that the smart key holder looks stylish. It works nicely with men’s leather belts or even men’s scarves. That means that you can use it to complement your overall look. To me at least, that is a major advantage. Now, the drawbacks. Stacking the keys to the brim of the holder will make the deployment of the keys a nightmare. Therefore, my advice would be not to overdo it. Other than that, the biggest drawback of the smart key holder is that the screws tend to get loose fairly quickly. Worst of all, that can happen when you do not tighten the screws enough. Say goodbye to bulky keyrings, annoying thigh pokes, and key jingle for good – organize that mess and free up your pockets with a KeySmart Key Organizer! How many birthday, Christmas, or holiday presents can you eliminate right now? KeySmart is the perfect stocking stuffer or gift for any occasion that all key owners will love! In case the smart key holder is not macho enough for you, maybe the KEYTEC compact organizer can hit your soft spot. 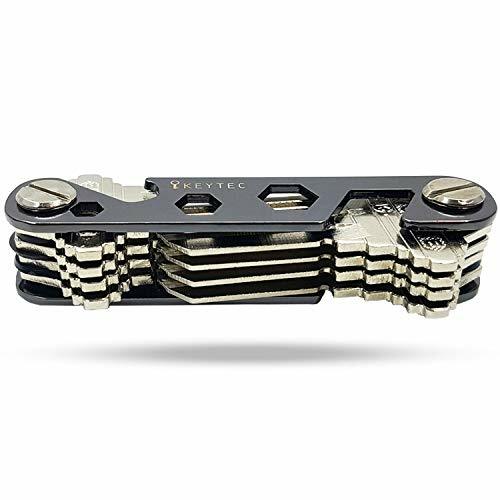 Not only is it a key holder capable of holding up to 14 keys, it is also a multi-tool of sorts. With it, you get a bottle opener, wrenches, as well as a phone stand. All in all, if you are looking for a full EDC package within a single key holder, look no further than the KEYTEC . MULTI FUNCTION TOOLS – Intelligent Engineered Design equipped with three practical features all in one compact machine. BOTTLE OPENER & PHONE STANDS. These tools will absolutely come in handy at your workplace, when you are travelling or at the restaurant. You do not need to buy extra accessories and still able to keep all of your keys up to 12~16. LOOP can be attached to your car keys & key rings etc. Additional expansion kit (6 spacers and 2 extension metal) included. DURABILITY – The body frame is made of significantly high impact resistant material ZINC ALLOY(Aircraft Grade). The Screws have Anti Loosening washers to prevent your keys from falling and safely keep all your keys together. Extremely durable body frame is 1.55mm thick, each has smooth surface and rounded edges will definitely organize all your bulky mess of keys in one simple machine. FRIENDLY VIDEO USER’S GUIDE – To help you assemble your keys we provide a video assemble demonstration by sending you an email with video attachment after you order purchased. For your CONVENIENT ASSEMBLY, the video instruction will be sent to you and easy step by step guide to follow. You don’t need to have a screw driver to assemble. You may use a bus card for immediate situation to assemble. GREAT GIFT FOR YOUR FRIENDS AND FAMILY – KEYTEC is neatly packaged in a luxury white sturdy box. If you are looking for a birthday gift or anniversary, KEYTEC is great gift idea that would give delight experience to anyone for a little gadget. We guarantee 100% Satisfaction, if for any reason you are not fully satisfied with your order, we provide a full money back. Looks familiar? 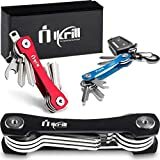 Well, in case you want to buy the smart key holder and save $5 along the way then the Ikrill is the perfect key holder for you. 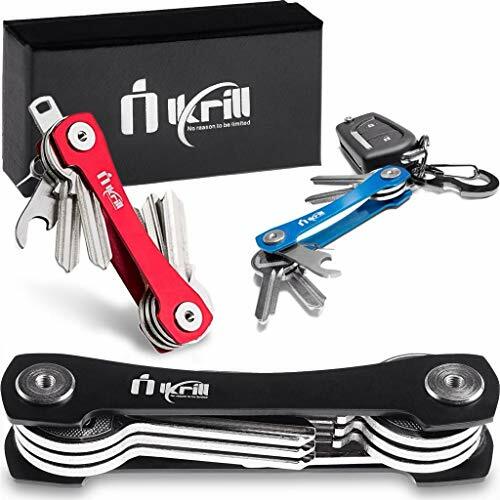 The only difference is that the Ikrill comes with a couple of useful tools which include a bottle opener and a sim opener. Essentially, it is a crossover between a Swiss Army Knife and the smart key holder. COMPACT & STYLISH – Ikrill key holder is made from high quality zinc alloy & Stainless Steel Bolts and Screws, anti-loosening washers are added to the screws to prevent unwanted loosening over time. Experience no more screw breaking and keys swing with this smart key holder! SMART GIFT with BONUSES -. Looking for Easter gifts, birthday or holiday presents? Don’t look further! Surprise your loved ones with a Compact Key Organizer Keychain! Your set includes: loop pice for your Car keys or Fob, carabiner to can hook your keys to a bag or a belt, the stainless steel bottle opener always at hand if you have a drink with your friends, expansion pack and sim opener. PROTECT YOUR POCKETS AND PURSE – forget about uncomfortable pocket bulges. This minimalist keychain conceals the sharp edges that damage leather and pock holes in your pants. The extended version can hold up to 20 keys or accessories, organizing your keys in an instant. ULTRA LIGHTWEIGHT & EASY TO USE – Swiss style & ergonomic. This key chain design won’t add any extra heaviness to your collection of keys. EASY ASSEMBLY, NO CUSTOM KEYS NEEDED. LIFETIME WARRANTY: If for any reason you aren’t happy with your smartkey compact key holder please contact us so we can organize a replacement or a full refund. Finally, here is something a tad more elegant for the gentlemen among you. The ThorKey is made from 100% vegetable tanned leather. It works on the same principle as the smart key holder but it is very limited in regards to the length of the keys it can fit. It prevents the annoying dangling sound as well as scratching your phone on your keys. However, it suffers from the same drawbacks as most other key holders. VEGETABLE TANNED LEATHER: We love the environment as much as you do, so we make our products from 100% vegetable tanned leather. The top grain Italian leather is very durable and ages beautifully which will make this unique and practical key carrier last a lifetime. One of the greatest house warming presents and the perfect gift for Father/Dad, grandfather, Husband, Uncle, Boyfriend, Men, and Women. A great minimalist key organizer. COMPACT SMART DESIGN: This top notch leather keychain features a very practical, compact design that makes it perfect to fit your pockets. 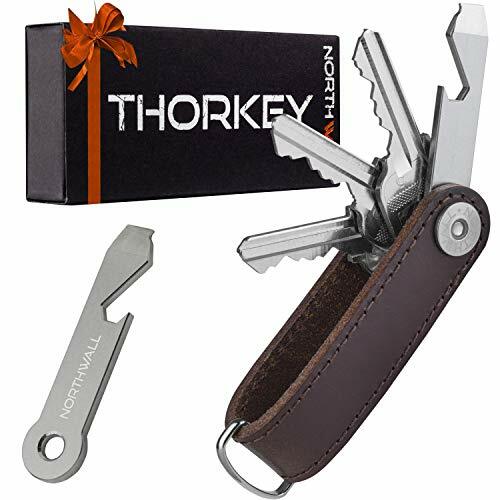 Clutter and holes in your pockets are a thing of the past with the ThorKey. Your keys are stored neatly with the space saving design. The perfect housewarming gift for every man and woman! 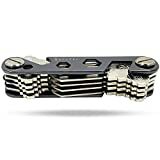 ORGANIZE YOUR KEYS: The ThorKey Swiss Army keychain organiser can hold up to 10 different keys or tools and is perfect as a key fob holder to serve all your needs. It tightly holds the keys together and it eliminates the frustrating jingling sound all key bundles produce. It also protects your mobile phones and other sensitive accessories from scratches. SECURE LOCKING MECHANISM: The new ThorKey locking mechanism will keep your keys fixed and in position. The force to swing out the keys is adjustable by the torque of the bolt. Never again lose your keys because the bolt of your key organizer came loose. Three 0.15 inch diameter stainless steel bolts with a length of 0.79, 0.99 and 1.18 inch are included with this flat key holder and will keep your keys together in every situation! The 0.15 inch diameter bolts will fit almost all keys. 100% RISK FREE PURCHASE: Providing you with the friendliest customer service is our number one goal. This is why we offer you a money back guarantee in case this leather key case does not live up to your expectations. I would say that the smart key holder makes a great investment. Not only will it keep your pockets intact and keys organized, but it will make you look cooler than ever before. If you are fine with dealing with some of its minor drawbacks, I would say that there is nothing more to think about. Get your keys sorted out immediately. To find out more about the smart key holder, click here .